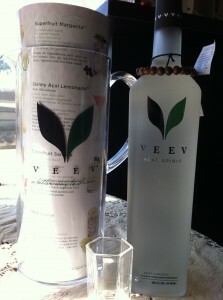 Recently a friend gifted me with a bottle of -for me- a brand new spirit: Veev acai liquor. He had tried it on his own and was not impressed……said it had an earthy flavor, with almost chocolate notes. I was intrigued. Finding myself with an entire bottle of the stuff plus pitcher and recipes, what does Shaker One do? Why, invents her own concoction of course! Fresh ripe strawberries muddled with chocolate mint leaves ( Yes, you read that correctly. I have chocolate mint growing in The Balcony Bar garden), shaken over ice with Veev and a dash of chambord. All I can say is this is my kind of health food! Yum and yum. Fruity with just a hint of sweetness…..you get a very subtle taste of the chocolate mint. This one is a winner. 4 olives. 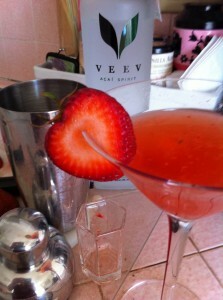 Now I must admit that when I tried a sip of the Veev straight I was skeptical. It smelled like the jello shots I make for tailgating season. Oddly sweet and indistinctly fruity. It looks like vodka-completley clear, but does have a touch of sweetness to it. I read the suggested recipes and was uninspired. Now that I’ve given it a run I can see it playing very well with different fresh berry flavors….and perhaps even in a dessert martini. You can read for yourself all the supposed heath claims for this “miracle fruit”. Thanks Simon for sharing and inspiring!! Now I’m off to take my *winkwink* vitamin……and no, I’m not wearing the bracelet.